During the later part of Shenmue, Ryo seeks "gainful employment" at the New Yokosuka Harbor, in an area of Yokosuka called Amihama. In fact, both of these placenames - Amihama and New Yokosuka Harbor - do not exist in real life. However with some detective work, we can investigate where the game's harbor would be positioned on a real-life map if it did exist. The approach will be to gather as much information as possible from within the game (as well as any clues found elsewhere) and through a process of elimination track down the secret identity of Amihama. Aerial view of Yokosuka. The harbor can be reached by a short walk (marked in orange) from Dobuita Street. While the location of the US Navy Base makes it natural for sailors to feature in the plot of first Shenmue game, the ease of foot access to the harbor in real life may seem to contradict its portrayal in the game, where Ryo must take a bus or other form of transport. 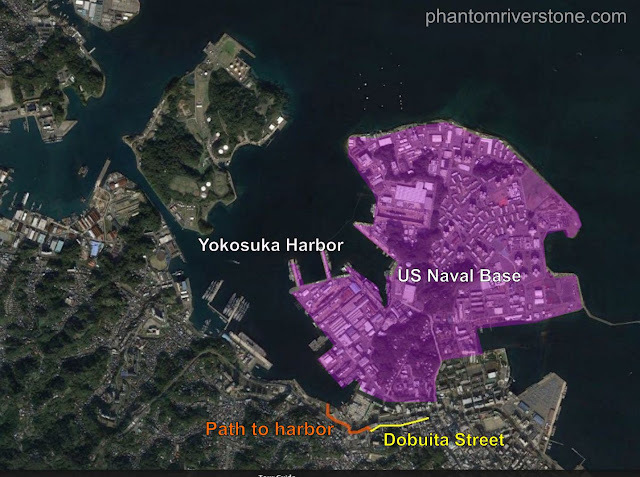 The need for transport in the game could be explained away as a contrivance introduced for plot purposes, but a more compelling possibility exists: that New Yokosuka Harbor is based on an entirely separate part of the harbor. 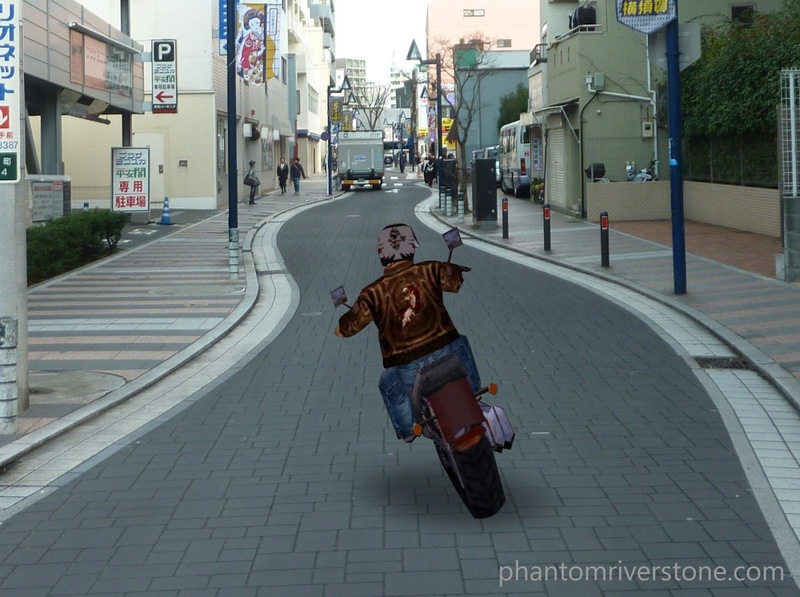 On a recent visit to Dobuita Street, this crazy biker almost ran me over! 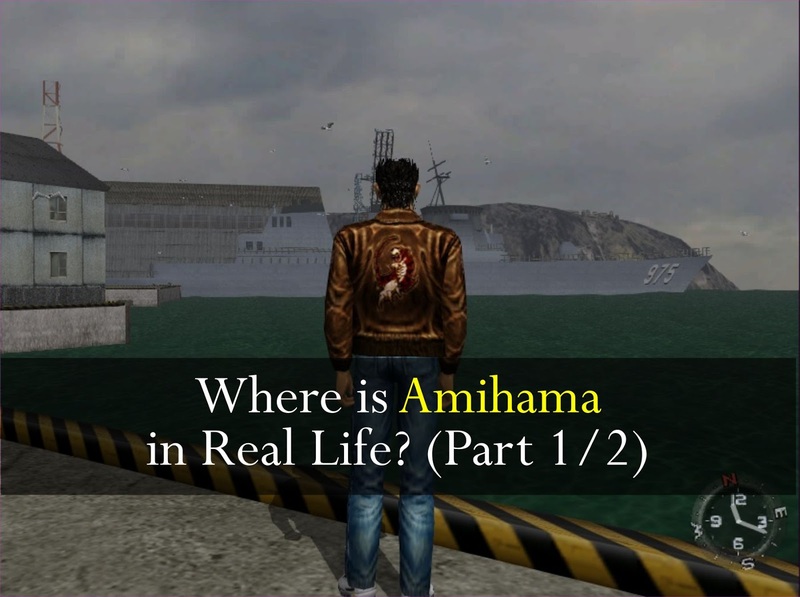 Amihama is the fictional name of the area in Shenmue where the harbor is located; it is where Ryo finds Warehouse #8, Mad Angels and learns how to operate a forklift, among other things. The last post delved into the bus service in the game that takes Ryo to the harbor, such as where the bus-stop is located in real life and the similarities in signage with the actual bus system in Yokosuka. Later in the game, Ryo borrows a motorcycle and rides to the same destination, this time under player control in a high-speed dash to the harbor. Unlike with the bus ride, which does not show any scenery, with the motorcycle ride we get to see the entire stretch of road. 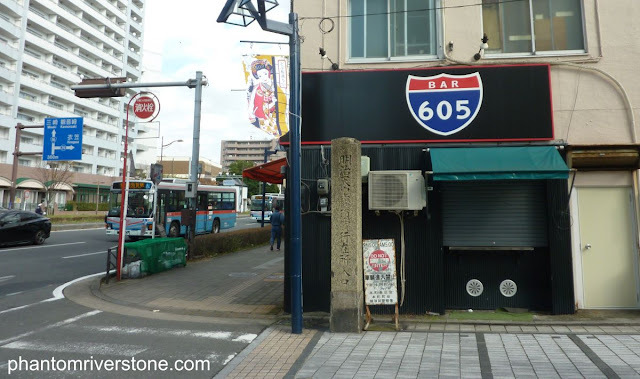 In this post we'll compare the appearance of the roads and urban landscape Ryo passes through, to actual roads in the Yokosuka area. 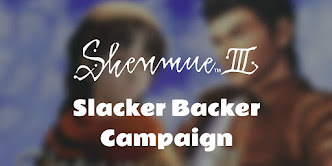 Consistent with the Shenmue approach, Yu Suzuki and team have incorporated many recognizable features that are representative of the area. 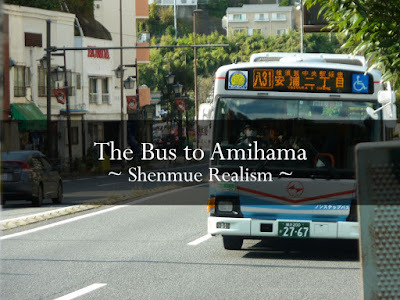 In the first Shenmue game, Ryo makes good use of the bus service that runs past the end of Dobuita Street, to take him over to the harbor area at Amihama. 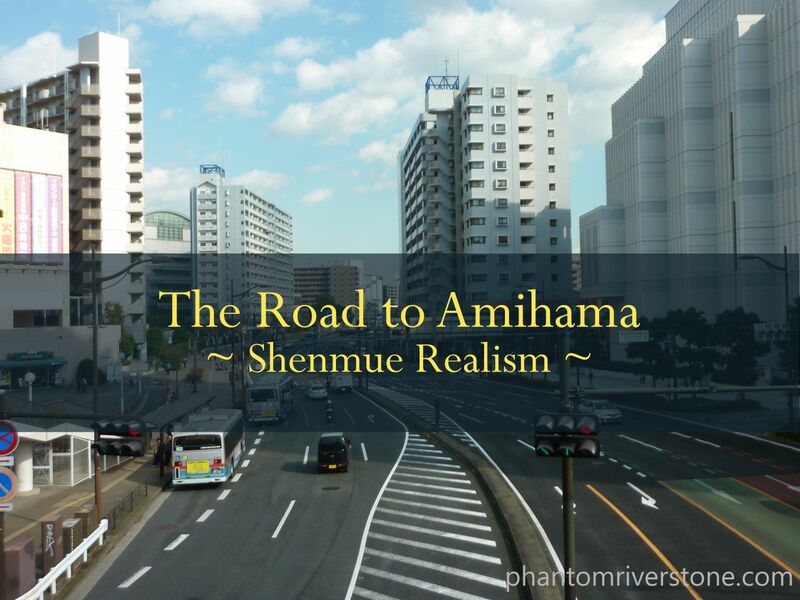 Although it was created for the game, as with most things in Shenmue it is grounded in realism. In this post we'll run through the information the game gives us about it, and see how closely it matches up to the present day. To start off, below is a photograph I took recently in the vicinity of the real Dobuita Street, at a corner intersecting with the main road - called the Yokosuka Highway - running nearby. 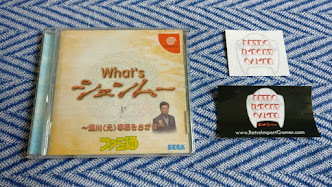 Although this corner is not situated at the actual end of Dobuita Street, the location's similarity with a certain tobacco shop at the end of Dobuita Street in the game can be readily appreciated. I expect to see Hirata-san tottering out through the door at any minute. 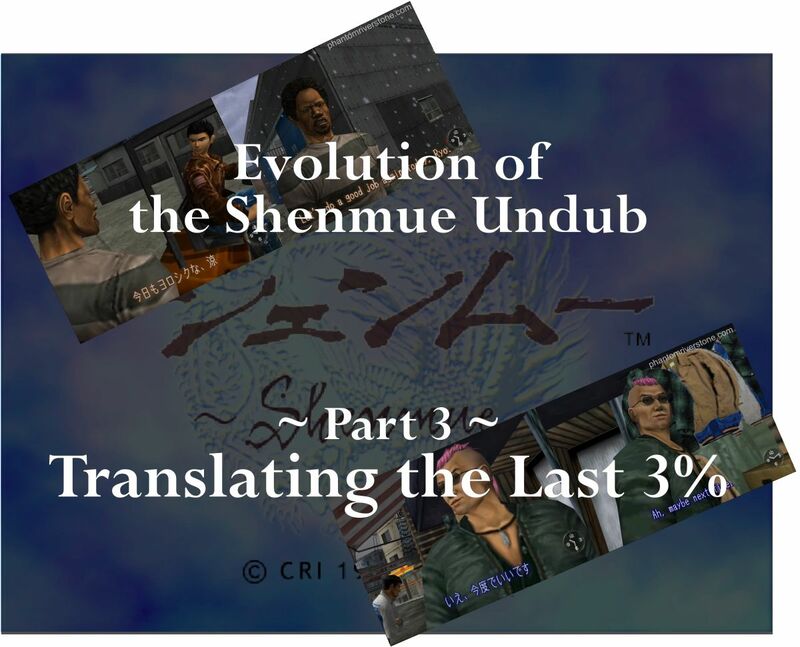 Over the past half-year (with support from the French-language fansite Shenmue Master and others), I have been working on translating the small percentage of subtitle lines in the Kogami undub that were still displayed in Japanese - as well as including a few other miscellaneous fixes. The point has now been reached where the work has been completed, and once fully tested this updated version will be released to the community in the future. 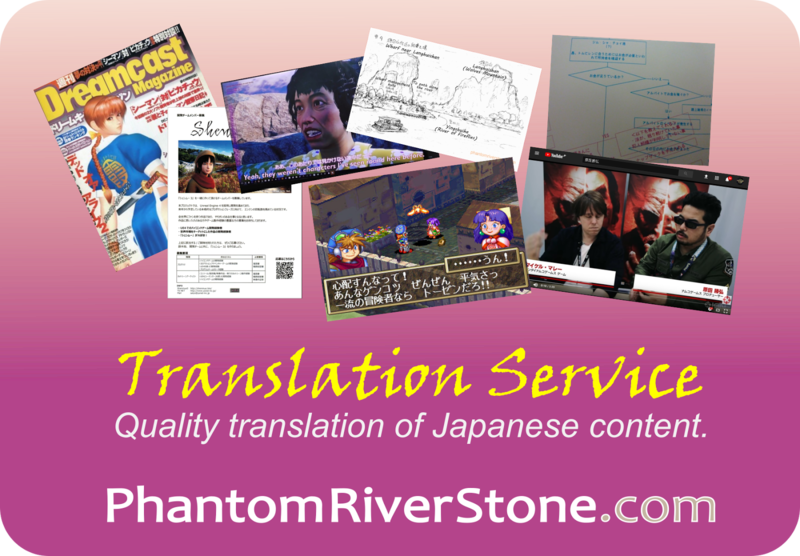 This post goes over the various changes that have been made for this "100% translated" version. Shenmue III co-producer Cédric Biscay of Shibuya Productions has shared a photo of himself with Yu Suzuki, during his visit to Tokyo. "Amazing time with my friend @yu_suzuki_jp ! 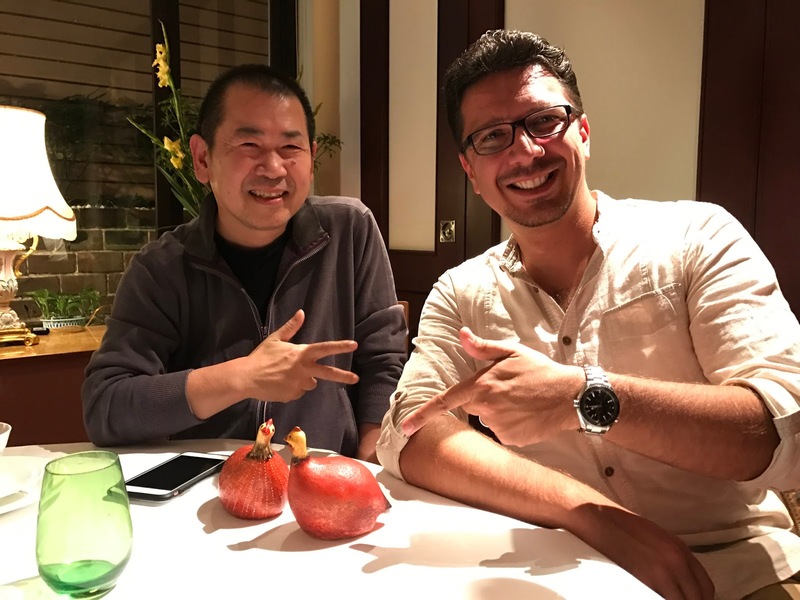 #Shenmue3 cc @ShibuyaProd @YSNET_Inc"
Although no special information can be gleaned (still working on decoding the rooster message), it's good to see Cédric and Yu Suzuki looking relaxed and catching on the Shenmue III project.